The Keating Channel is a 1,000-metre (3,300 ft) long waterway in Toronto, Ontario, Canada. It connects the Don River to inner Toronto Harbour (Toronto Bay) on Lake Ontario. The channel is named after Edward Henry Keating (1844-1912), a city engineer (1892-1898) who proposed the creation of the channel in 1893. The channel was built to connect Ashbridge's Bay to the harbour; later, the Don was diverted into the channel, and its river mouth filled in. Channel, looking east from Cherry St. The channel ends about 5 m behind the camera's viewpoint, the Don River entering in the far background. Prior to the 19th century, the Don River naturally entered Toronto Harbour in two mouths, one roughly near where Keating Channel now flows out and one further south. In the late 19th century, a public works program was started to straighten the lower part of the Don River south of the Winchester Street Bridge. The project was called the "Don Improvement Project". The goal of the project was to alleviate floods on the lower Don that were periodically washing out bridges. It was also done to create additional wharf space for the Toronto harbour. When it was completed, the river was directed south into Ashbridge's Bay. At the time Ashbridge's Bay was still a lacustrine marsh. It was heavily polluted by local industry. The water from the river was diverted into the bay with the hope that it would flush the bay of the poor water. However the flow of water introduced raw sewage in the river into the bay. The bay water remained stagnant and was increasingly becoming a serious health risk. The Keating Channel was proposed as a method of directing the dirty river water into the harbour thus dispersing it more rapidly. The channel was planned to go from the northeast corner of the inner harbour east towards Leslie Street and join up with the Coatsworth Cut at the foot Coxwell Avenue. However, the portion east of the Don River was never completed and it was closed in 1916. The channel was completed in 1922 after eight years of construction. The completed channel now runs from the harbour east to the mouth of the river, a distance of about 800 metres. The original mouth of the Don is buried under infill near where the Gardiner Expressway meets Cherry Street. The original course from the mouth upstream now lies underneath railway tracks used by GO Transit for storage. The channel is flanked on the north by the elevated Gardiner Expressway and Lake Shore Boulevard East. The south side is occupied by the PortsToronto aka Toronto Port Authority works yard and the Keating Channel Pub. At the west end Cherry Street crosses the channel over a single sided drawbridge rarely used by ships. At the east end is the start of the Don Valley Parkway. In the 1940s the watershed further up the Don River became more urbanized. This caused an increasing amount of silt to flow down the river. The silt collects in the channel where there is very little water flow. Since that time, the Toronto and Region Conservation Authority (TRCA) has been dredging the channel. The dredgeate material is barged out to the Leslie Street Spit where it is dumped in a containment area built for this purpose. In 2005, the annual amount of silt dredged was about 35,000 cubic metres. The containment area has the capacity to take 50 years of Don River dredgeate . "That the issue of the need for dredging Keating Channel remains unresolved and that a hearing on this specific issue should be held as soon as possible and before any irrevocable approvals are given. During World War One a small shipyard on the Keating Channel built vessels for the war effort. Canada's Federal cabinet published a tender for a railway swing bridge over the channel in 1896. Construction began in 1900. Early in its history the banks of the channel were lined with industrial enterprises, including a small shipyard, the Toronto Shipyard Company, which built vessels for the war effort. The channel has always been dredged, to continue to allow navigation. In the 21st century, with its role as a cargo route over, the channel is only dredged to a depth of 5.8 metres (19 ft).Toronto Life quoted Toronto harbour master Angus Armstrong's explanation that the current dredging efforts are aimed at "whatever is needed for the health of the river." The channel's impact on the Don River is varied. Both sides of the channel are lined with concrete dock wall which creates a barrier and provides little habitat for fish and other water dwelling creatures. The Don is home to about 21 species of fish. Only about four or five species can be found near the mouth. This is partly due to poor water quality but also due to lack of habitat. The dock wall continues, mostly unbroken, north to Riverdale Park. This is in contrast to the Humber River to the west, which has a natural mouth and is home to about 44 species. Another problem affecting the channel is floating debris that is washed down the Don. Composed largely of logs and dead wood, there is also an assortment of garbage that collects in the channel. The TRCA corrals this material with a boom across the channel. There can be significant flotsam where the Keating Channel enters Toronto Harbour, especially after a big storm. On the north side of the channel a slight bend in Lake Shore Boulevard has created a narrow open space. In 1998, the Task Force to Bring Back the Don planted Staghorn Sumac (Rhus typhina), Sandbar Willow (Salix exigua), and Red Osier Dogwood (Cornus stolonifera) in this area. Despite poor soil conditions, the willow and the hardy sumac have thrived. It is now a long narrow glade of small trees and shrubs. Another small green space at the eastern end was also planned for restoration but the project was abandoned after one planting. There was also a proposal to remove part of the dock wall to improve fish habitat. These projects were suspended when it became apparent that a larger project would be starting soon. In 1999, the three levels of government announced plans to revitalize Toronto's waterfront. Among the four initial projects was a plan to restore the mouth of the Don to a more natural outlet. In 2005, an environmental assessment was initiated to investigate options to restore the original mouth of the Don. Some of the options being considered would fill in the Keating Channel and direct the Don River through a new channel just north of Lake Shore Boulevard or straight south to link up or cut the inner basin shipping channel to the south of the Keating Channel. The environmental assessment process is ongoing. Proponents of restoring the mouth of the Don to a more natural state have argued that this restoration would ameliorate the damage expected from a rare flood with water-flow equal to or greater than that from 1954's Hurricane Hazel. Filling in part of the mouth of the Keating Channel, to construct Villiers Island. In 2018 the western end started to be narrowed, as part of the construction of Villiers Island. Villiers Island will have the Keating Channel as its northern shore. The Polson slip will be naturalized, and its channel extended to the Don River. ^ "Keating Channel". Geographical Names Data Base. Natural Resources Canada. Retrieved 2012-08-03. ^ "Official report of debates (Hansard) : Legislative Assembly of Ontario = Journal des débats (Hansard) : Assemblée législative de l'Ontario 1980". Hansard. 1980-11-13. Retrieved 2009-04-29. ^ "Notice to Contractors: Cherry Street Swing Bridge". Daily Mail and Empire. 1896-07-28. Retrieved 2012-03-22. ^ "425q". Privy Council (Canada). 1900. ^ Kevin Plummer (2011-10-08). "Historicist: On the Waterfront". Torontoist. Archived from the original on 2015-12-22. Retrieved 2015-12-15. By 1922, the Ashbridges Bay area had been reclaimed and serviced with the construction of the Keating Channel, Ship Channel, and Turning Basin. By 1933, the area housed oil refineries, coal facilities, and factories, according to Toronto Harbour: The Passing Years (Toronto Harbour Commissioners, 1985). ^ Chris Bateman (2015-10-15). "How muck from the mouth of the Don River becomes new land for the Leslie Street Spit". Toronto Life. Retrieved 2015-12-15. PortsToronto dredges the Keating Channel to an approximate depth of 5.8 metres, which is more than two metres shallower than the rest of the harbour. ^ "Don Mouth Naturalization and Port Lands Flood Protection Project". 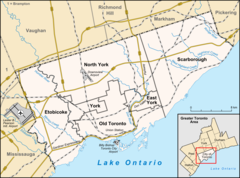 Toronto and Region Conservation Authority. 2008. Archived from the original on December 11, 2007. Retrieved 2009-04-29. ^ Tanya Mok (March 2018). "Toronto is getting a new Island". Blog TO. Retrieved 2018-08-13. By reconstructing the mouth of the Don River, the city will form a new river valley which will direct water into the Keating Channel and the flood harbour, thus creating Villiers Island in the Port Lands.